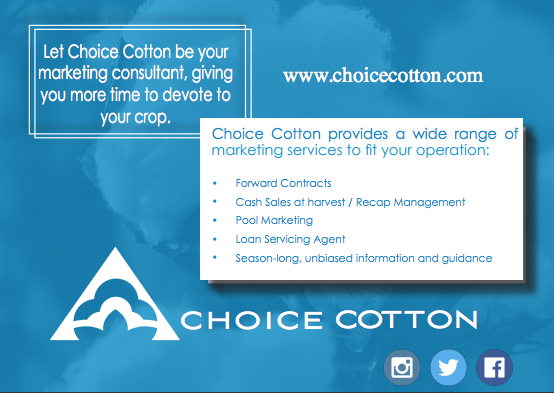 We offer several options for marketing your cotton, so you can maintain control in the trade and receive a higher profit. For producer-customers we will find reliable buyers, communicate the best basis, explain contract options and terms, deliver and interpret relevant market news, advise producers on a marketing strategy and provide as much support as wanted in the execution of that strategy. Choice Cotton serves two types of customers: Producers and Buyers. For buyer-customers, we will provide a large supply of cotton from a trustworthy source and deliver useful industry news. Seasonal Pool: A member can turn marketing a pricing decisions over to a full-time marketer by choosing the AQCA Seasonal Pool. The Seasonal Pool seeks to balance risk with pricing decisions, to obtain a price that is significantly better than members could obtain on their own. A 45-year history of proven performance makes the Seasonal Pool the most popular choice among members. Forward Contracts: For members who choose to make some or all of their pricing decisions, AQCA will recommend the best contracts available, explain those contracts and interpret market information, and offer advice on contract pricing. AQCA will supply each member the level of support they choose. Recap Management: For any member who does not choose the Seasonal Pool or Forward Contract options, AQCA will assist you to market your crop as it is harvested. A “Recap” is a simple description of the quality and quantity of bales to be sold. Recaps can be sold as a cash sale or as a loan equity. AQCA will provide advice on Recaps to maximize return to the member. LSA: If members prefer, AQCA will act as a Loan Servicing Agent to process your cotton into the government loan and return the cotton to you as you choose.